I know I have been away for a while, and that deserves a post all of its own, for today I want to talk about how I will be observing Lent this year. I am following the 40 Acts of doing Lent generously. Each day I get an email that tells me what the action for that day is. I must admit I really like this as I am not great at giving things up but do like an extra discipline during Lent. In fact, this year doesn’t really feel like a year for giving up things considering all that I have been through. Today’s act was about circles. The circles of connection with the other people that I know and care about, circles of connection even with those that I don’t know that well. 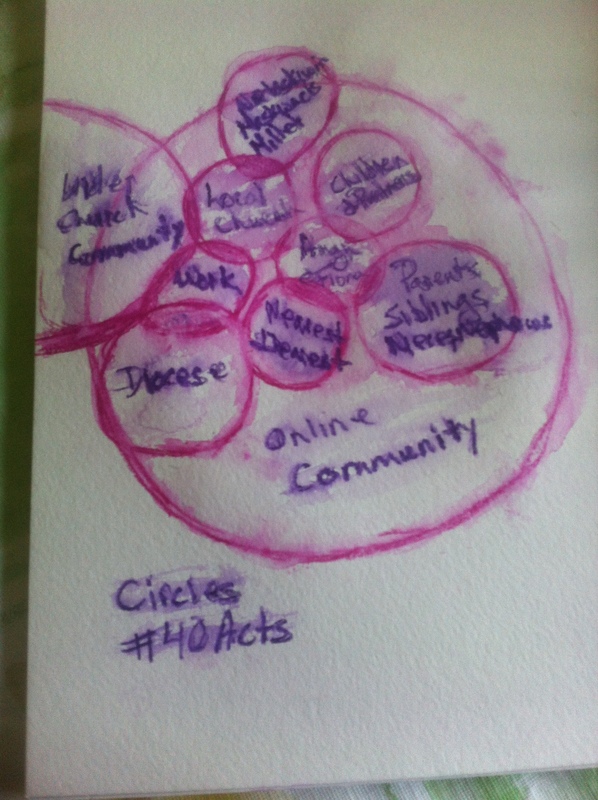 The task was to draw, doodle, sketch your circles and then if you had time to pray for them. That’s what I did this morning. I put on some quiet Canadian folk music and went at it with my water colour pencils. If you look closely – you will see the dear one and I in the centre of the circle and then it moves on from there. Circles interacting, showing community and connection in all parts of my life. When I finished I took a few moments and prayed for each circle of connection – each community that I am fortunate to be a part of and know that many have prayed for me. I told the dear one later that morning that the focus felt good and important. It felt like I was able to connect in a way that I hadn’t been able to lately. My plan this Lent is to post blogs about this experience of doing Lent generously as the Spirit moves me, to be guided by the connections that I will make. May you all have a holy and generous Lent.